This is my local take on Maraschino cherries, but instead of Maraschino liqueur I used our local sweet wine, Passito di Pantelleria. 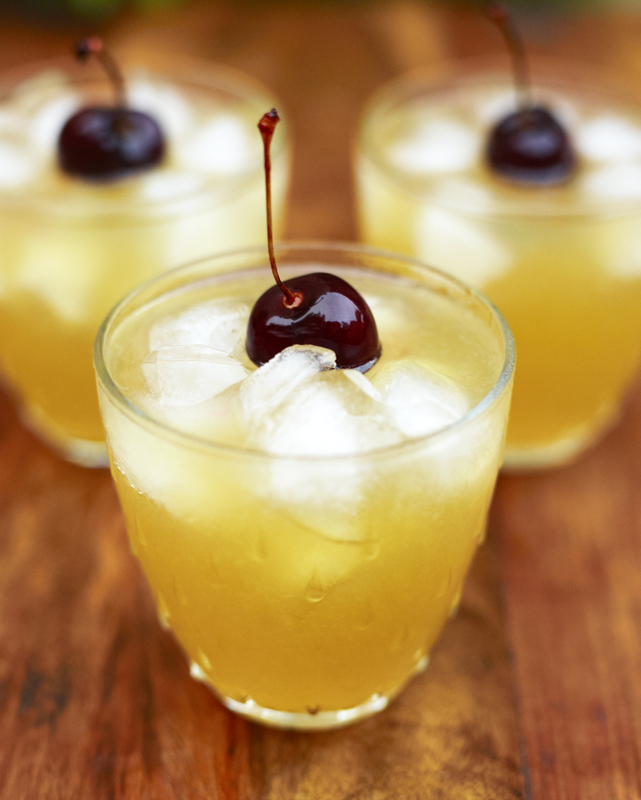 Originally maraschino cherries were made from marasca cherries (originated in Croatia) which were then preserved in Italy’s maraschino liqueurs. Since I am not using Maraschino liqueur, rather Passito di Pantelleria such as Sangue d’oro and the local cherries “Amarena”. The cherries need to sit in the jar for about two weeks to really soak in the spices before serving. Eat the cherries as a dessert with or without vanilla ice cream, place them on top of a cupcakes or as a garnish to a whiskey sour. Wash and remove all the cherry’s stones. In a saucepan, combine all ingredients excluding the cherries and the Passito allowing them to come to a boil. Reduce the heat to medium. Add the cherries and simmer for 8-10minutes. Remove from heat, add the Passito and let cool. 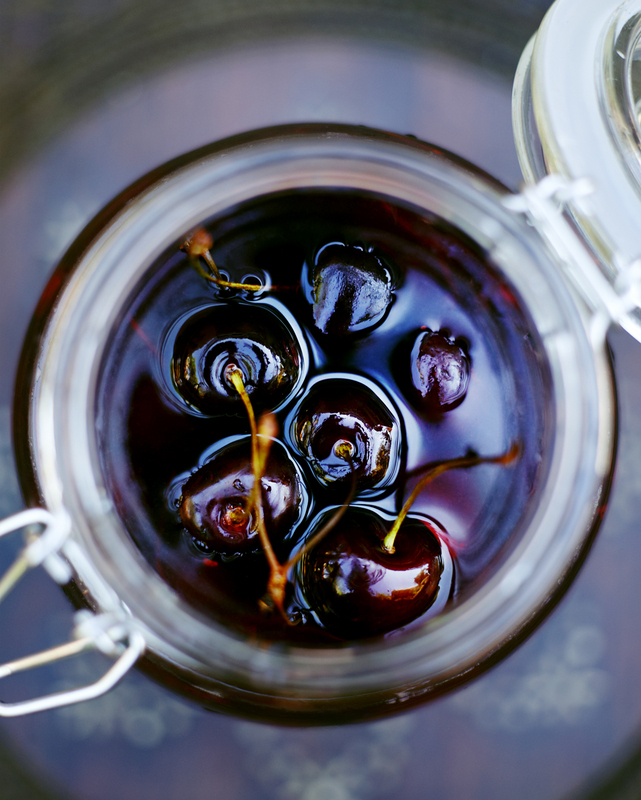 Transfer the cherries and liquid into clean jars and cover tightly and refrigerate for two weeks. Mix all the ingredients in a shaker with ice, shake and serve with a cherry on the top. If it’s a hot summer day serve with some extra ice. This entry was posted in Almond Bar, Dessert Recipes, Drink Recipes and tagged Almond Bar, Anna Huerta, Cherries, dessert, dolce, http://www.annahuerta.com/, Pantelleria, Passito di Pantelleria, Sangue D´oro, Sicily, summer, Under the Almond Tree on July 24, 2014 by Anna Huerta. 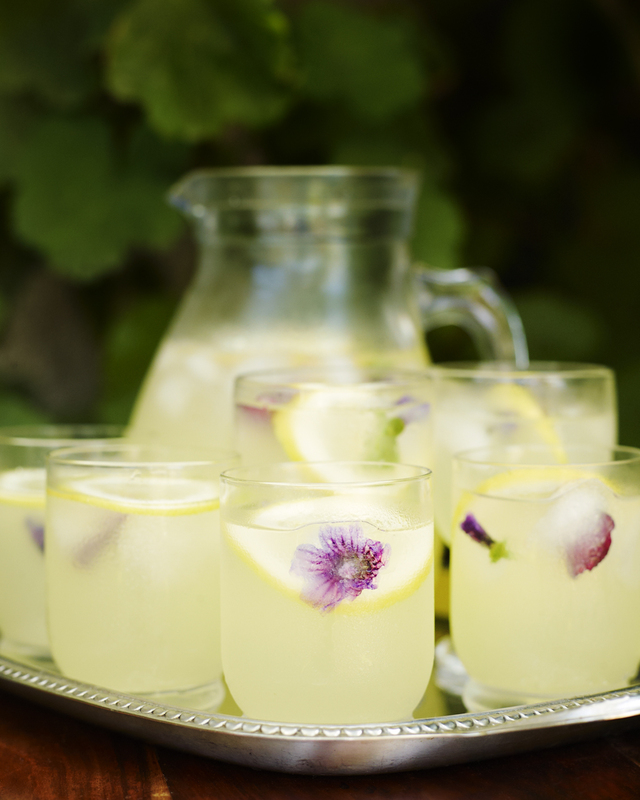 This last days has been really hot and what’s better for a dry mouth than a lemonade this hot afternoons in the garden. I usually make a lemonade concentrate and if there are leftover I pour it in a bottle and save it in the fridge. 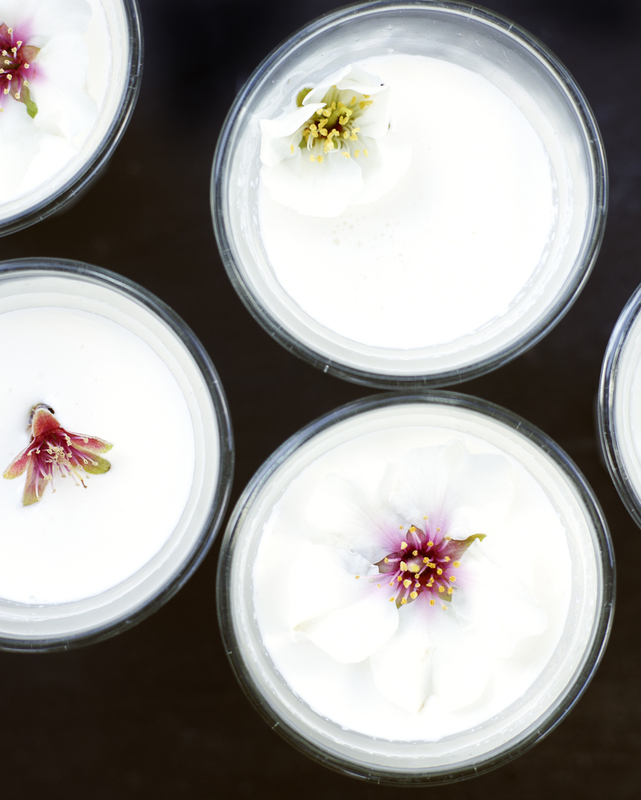 When serving I couldn’t resist decorating the lemonade with some mallow flowers. If you have extra time on your hand you could also freeze eatable flower in the ice cubes to give it a summery and colorful look. Start by making a simple syrup. Warm sugar and water in a small saucepan on the stove, stir until the sugar has dissolved and incorporated into the water, set a side. Squeeze the juice from the lemons, if you so desire you can strain the pulp from the juice or leave it in. Combine the lemon juice and the simple syrup stirring to make sure they are full incorporated. 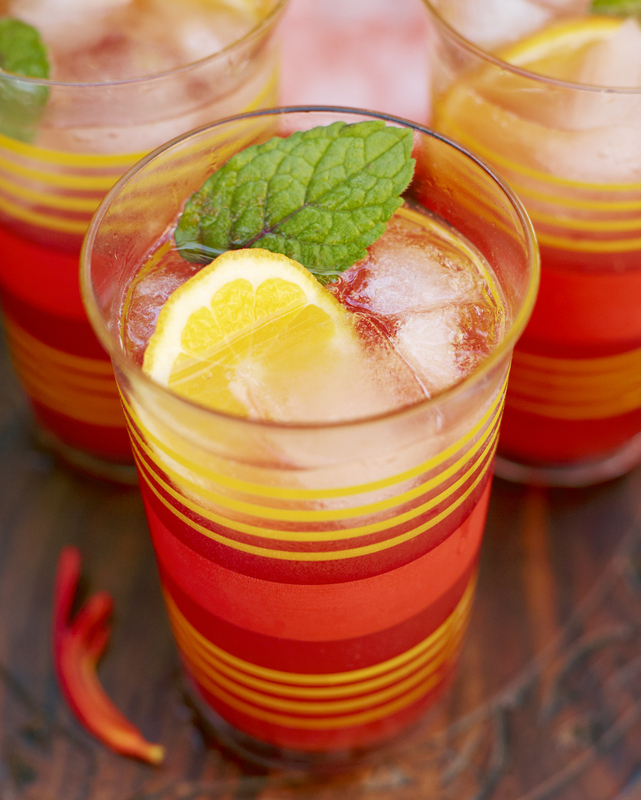 Fill a pitcher or glasses halfway with ice cubes and lemonade concentrate. Add either sparkling or still mineral water to dilute. This entry was posted in Almond Bar, Drink Recipes and tagged Anna Huerta, http://www.annahuerta.com/, lemon, lemon tree, Lemonade, Pantelleria, Sicily, summer, Under the Almond Tree on July 14, 2014 by Anna Huerta. This week we had days of stormy weather in Pantelleria, today it’s seems to have calm down and there is hope for a summer is coming. While we wait for the weather to get warmer my friends and I are going to sip on these Sunny Aperol this late afternoon in Almond Bar. Please join us in spirit if not in person! 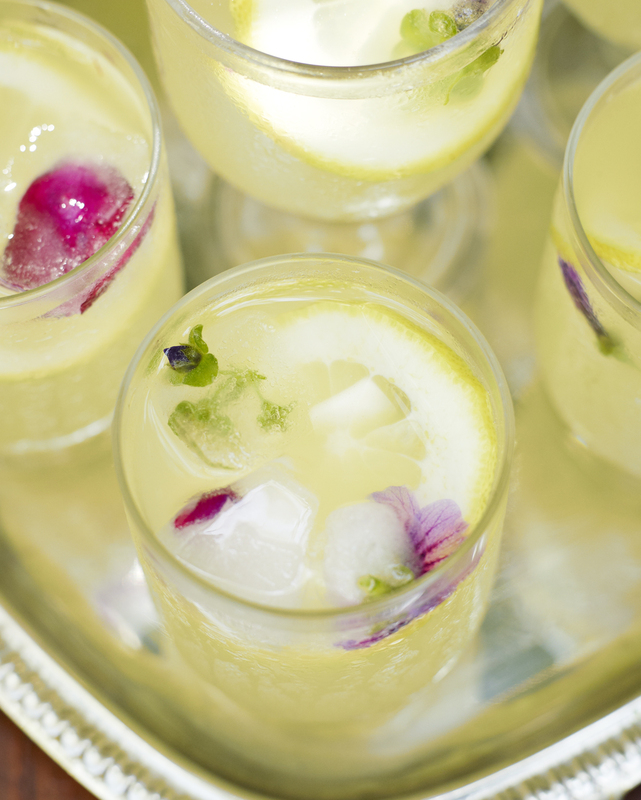 Fill up with Prosecco and garnish. Serve right away! This entry was posted in Almond Bar, Drink Recipes and tagged Almond Bar, Anna Huerta, Aperol, cocktail, drink, orange, Pantelleria, Sicily, summer on May 24, 2013 by Anna Huerta. The almond tree that this blog is named after is now in full bloom. 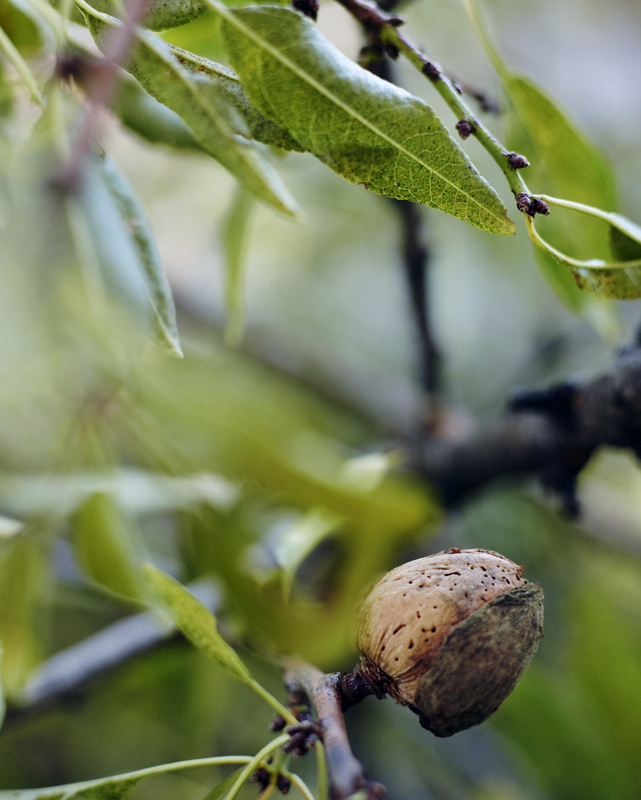 Almond trees belong to the plum family and the almond is the core of the almond fruit that is a stone fruit. It is not actually a nut. 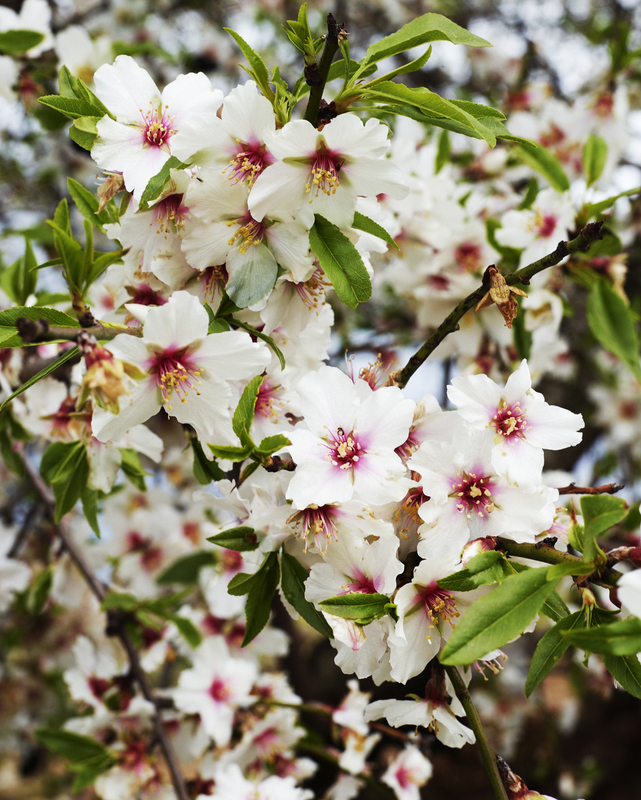 Here in Pantelleria the almond trees are now covered with white/pink flowers. 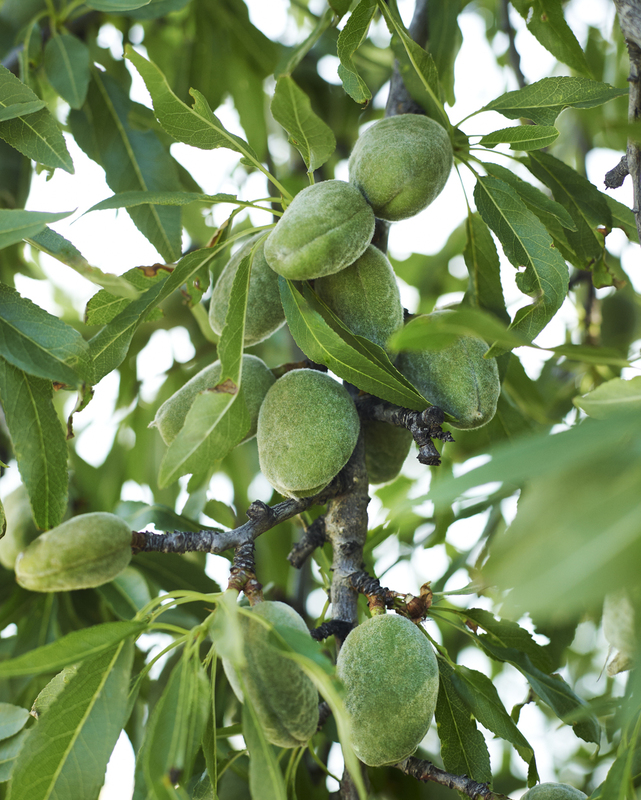 Almonds are an important ingredient in the Pantescan cuisine. I love to use almonds both in cooking and baking and, of course, just eating them plain. When the bloom period is over the trees develop their foliage. After that the fruit is at first green (see picture below) and has a soft shell similar to the peach. This skin will dry over the summer and fall off when the stone fruit is ready. 18 cups (2.8 liter) room temperature bottled water, you will need to 6 cups (14 dl) per soaking (2 times) 6 cups for blending. Place almonds together in a large bowl that can accommodate both the almonds and the water so the almonds are covered by the water. Cover with plastic and allow them to soak 4 hours. Then change water and do the same procedure soaking for another 4 hours. 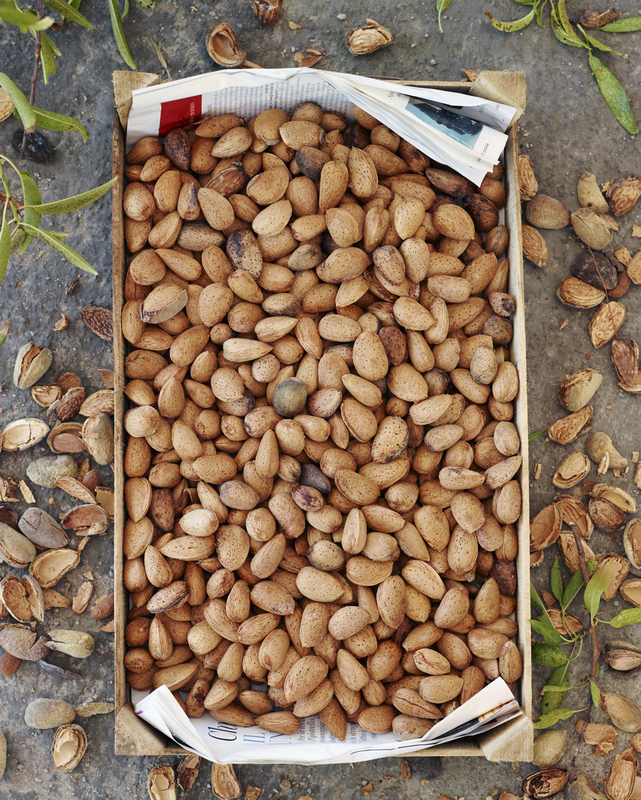 Drain and rinse almonds with fresh water using a colander. Using a blender or food processor, mix the almonds with 6 cups bottled water, and add honey. Mix together using a blender or food processor (taste if you want it sweeter, add some more honey). Place the mixture back into the bowl and cover with plastic allowing it to rest for 2 hours. If you want, now is the time to add a little vanilla seeds or grounded cinnamon to taste. 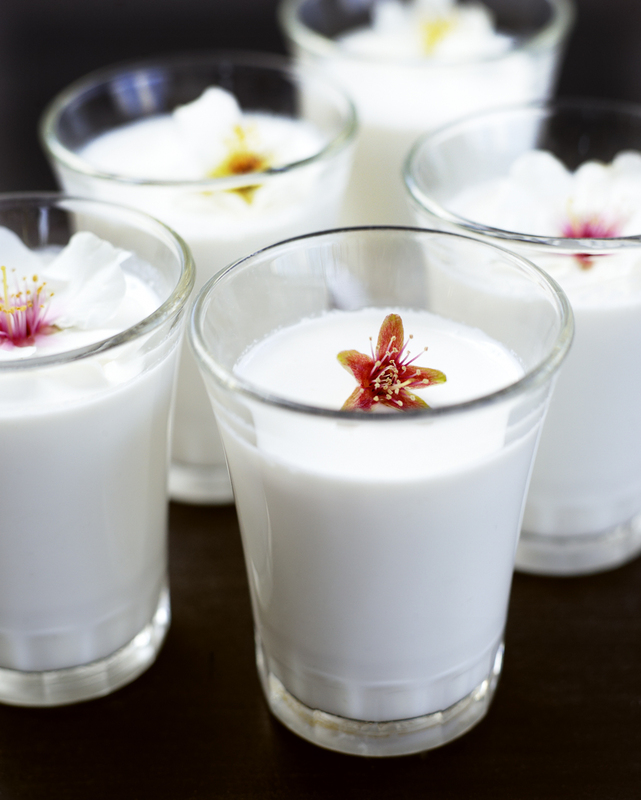 Strain the almond milk through a cheesecloth or a strainer, serve well chilled. Store the almond milk covered in the refrigerator. It has a possible shelf life 3-4 days when properly stored. This entry was posted in Almond Bar, Drink Recipes, Pantelleria and tagged Almond Bar, almond milk, almonds, annahuerta, drink, http://www.annahuerta.com/, Pantelleria, Sicily, Under the Almond Tree on February 5, 2013 by Anna Huerta.